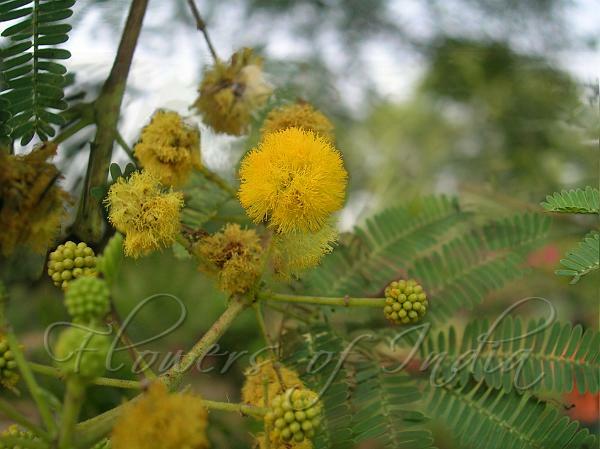 Babool is a medium to large tree, native to West Asia, that can reach a height of 10 m, with an average of 4-7 m in height. The crown is somewhat flattened or rounded, with a moderate density. The branches have a tendency to droop downwards if the crown is roundish. The bark is blackish grey or dark brown in mature trees and deeply grooved, with longitudinal fissures. The young branches are smooth and grey to brown in colour. The young twigs are covered in short hairs. Paired, slender, straight spines grow from a single base and sometimes curve backwards, are up to 80 mm long and whitish but often reddish brown in colour. The leaves are twice compound, i.e. they consist of 5-11 feather-like pairs of pinnae; each pinna is further divided into 7-25 pairs of small, elliptic leaflets that can be bottle to bright green in colour. Flowers are bright yellow, numerous, in fluffy globular heads 1.2 cm diameter, usually in clusters of 2 to 6, on individual pubescent axillary stalks 1.5 to 2 cm long.